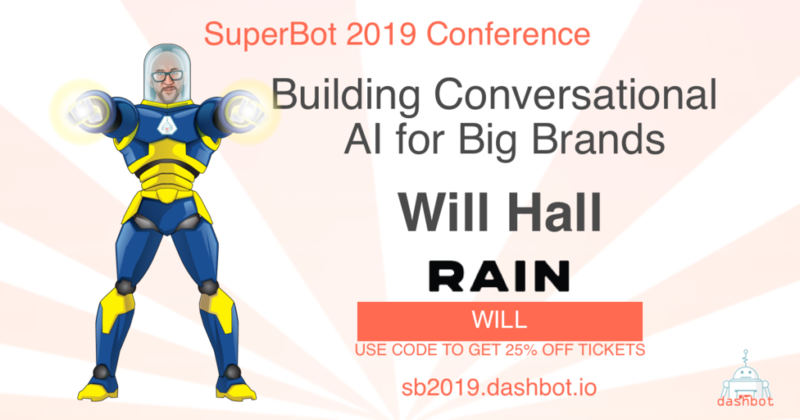 At SuperBot 2019, design expert Will Hall will share his experience as RAIN‘s creative lead and how he communicates a client’s branding through voice and conversation technology. Will is the Chief Creative Officer at RAIN, where he not only set the agency’s own vision, but also leads accounts for 35 Fortune 100 companies. He was the force behind the first branded Alexa skill. A designer himself by trade, he also serves on multiple advisory boards focused on Voice and Conversational technologies. Will believes that voice is the most human-centered technology that’s ever existed, so RAIN has been focusing on voice and conversational AI for the past few years. He is also a famous Pinterest personality, where his boards are renowned for their bizarre themes and pins. Over the past 14 years, he’s worked at agencies with key clients including Amazon, Adobe, Facebook, BlackRock, Sony, Alibaba, and Starbucks to name a few. He is also an Adjunct Professor of Design at NYU, where he established the curriculum for the undergraduate program for UX and Visual Design and currently teaches.